West Windsor, N.J. - Thirteen Mercer County Community College students and four staff members, including MCCC President Patricia C. Donohue, are getting ready to pack their bags for a 15-hour flight to South Africa in July. The lengthy journey will be well worth it, say students, who discussed their reasons and expectations for their South African Study Tour during an orientation session on June 5. 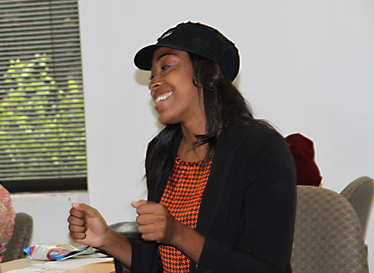 Led by Study Abroad Program Coordinator Andrea Lynch, the orientation included a "getting to know you" portion. Students shared their travel backgrounds. Many have been to the Caribbean, others to parts of Europe, but none to South Africa. The group includes travelers of all ages -- from as young as 16 to several retirees. All share a passion for experiencing new things and look forward to embracing the culture of South Africa. "This will be the trip of a lifetime," said Gerri Benjamin, a Human Services student. "I hope to learn about the culture and relate it to my work." Retired chemist Bernadette Eichinger decided to sign up for the trip as a noncredit student because she wanted to learn about South Africa from an academic standpoint. "I am always interested in how other cultures live, their politics and business perspectives, and the history that made them what they are," Eichinger said. "I see this trip as much more in-depth, no tourist stuff." Another noncredit student, Andrea Jackson, who plans to be a veterinarian one day, is especially interested in seeing how South Africans care for their animals, while Human Services student Linda Robinson is looking forward to taking in South Africa's natural wonders and also interacting with some of the local people to understand their lifestyle and their hardships. "We can learn from each other," Robinson said. As students introduced themselves, their mutual enthusiasm for the trip quickly became apparent. Suzieann Bennett summed it up. "I am excited to see, learn and do. I am just excited," she said. The 13-day expedition from July 15-27 includes a packed itinerary of cultural, historical, and natural destinations in and around Johannesburg and Capetown, as well as stops at educational institutions and communtiy service agencies. According to Lynch, the tour guide, Tribal Meetings, has an excellent track record of leading American groups, including college students from Rutgers University. Cape Town sites include Table Mountain, one of South Africa's most famous natural landmarks and The Slave Lodge, one of Cape Town's oldest buildings that has served multiple purposes over its long history. Students will also visit the University of Western Cape, a public university established in 1960 for "Coloured people" that was integrated well before the end of apartheid in 1994; Bo Kaap, an historical center of Cape Town's Cape Malay culture; Langa, Cape Towns oldest township; Robben Island, a site for imprisoned political leaders; the South African Holocaust and Genocide Foundation; the Cape of Good Hope, the farthest tip of Cape Peninsula National Park; and Boulders Beach, where a famous colony of African Penguins resides. 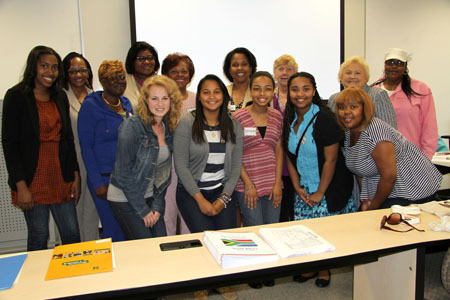 Ready for their South African adventure: front row, from left, students Sierra Downs, Anabell Reyes, Langston Lynch, Andrea Jackson and Erykah Jones; Back row from left, student Suzieann Bennett, African-American History Professor Dr. Deborah Sanders, student Linda Robinson, MCCC Director of Library Services Pamela Price, student Ruth Schuler, Program Coordinator Andrea Lynch, student Bernadette Eichinger, MCCC President Patricia C. Donohue, and student Gerri Benjamin. 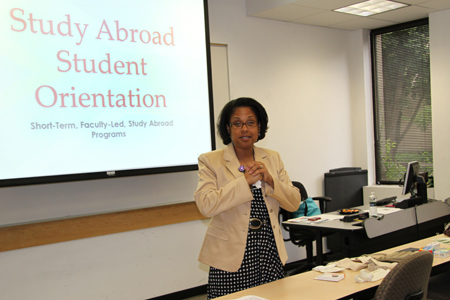 Study Abroad Program Coordinator Andrea Lynch led a four-hour orientation session for MCCC travelers. Nursing student Suzieann Bennett summed up the enthusiasm voiced by the whole group. "I'm just excited," she said. In Johannesburg, the group will visit Regina Mundi Church, examining its role as a gathering place in Soweto before, during, and after the anti-apartheid struggle; the Apartheid Museum, established in 2001; Nkosis Haven, an orphanage that cares for mothers and children with HIV/AIDS; Constitution Hill, where the story of South Africa's turbulent past and its transition to democracy comes to life; Pilanesburg Game Reserve, located west of Pretoria; and the Bruma Lake Flea Market, Johannesburg's largest market for local crafts, clothing and accessories. Students who are enrolled in HIS 109 (African-American History) will attend class sessions with Adjunct Professor Dr. Deborah Sanders prior to the trip. MCCC History Professor Dr. Craig Coenen will also oversee the curriculum. Upon their return, all students will gather for a wrap-up session on Wednesday, August 15, 5-8 p.m., in AD131 to share photos and observations of their time in South Africa. All are invited to attend. Coming up during the 2012-13 school year, Sociology Professor Dr. Gianna Durso-Finley and Biology Professor Laura Blinderman will be taking their students to Costa Rica during the colleges spring break in March. Other tentatively scheduled trips include a trip to Warsaw, Poland, and Prague, Czech Republic, in late May, focusing on the Jewish Holocaust experience of World War II, led by Associate Professor of English Jack Tabor, and a trip to the Yucatán peninsula of Mexico, led by History Professor Dr. Craig Coenen and Associate Professor of Spanish Daniel DArpa. To learn more about the colleges study tours and other study abroad options, click here.